When James Fowler started looking seriously at what it would take to get a new Salt Lake City– based distillery off the ground, there wasn’t a lot of financial support coming his way. “Banks didn’t want anything to do with it,” he says. “There’s no guarantee of getting a permit, so it’s huge risk on their part. I decided I would self-fund the project. That’s when I decided to start small.” Small is exactly right. Sugar House Distillery is based in a humble industrial space in South Salt Lake that houses their still and fermentation spaces, ingredient and barrel storage and a tiny retail shop selling their small-batch spirits—Vodka, Silver Rum, barrel-aged Gold Rum and Malt Whisky so far—directly to the public. Keeping the scale of production limited allows Sugar House to pay a lot of attention to each spirit in this small product line, and the commitment to quality is clear in tasting their spirits. Before starting to follow his dream of opening a distillery, owner Fowler was a regional representative for the chemical industry and had been homebrewing for 20 years on the side. His job took him to breweries and distilleries, and he often got to see a side that the rest of the public didn’t. “When I realized how similar brewing and distilling were, well, I just got more and more interested in the whiskey,” he says. “The still is just such a magical and beautiful piece of equipment—it was so intriguing.” Head Distiller Eric Robertson felt that allure as well—he got his start in the warehouse at High West Distillery in 2009 after building ski lifts for 15 years. “I started homebrewing when I was 18,” he says. “I needed a change of pace and responded to a classified ad for a warehouse assistant. 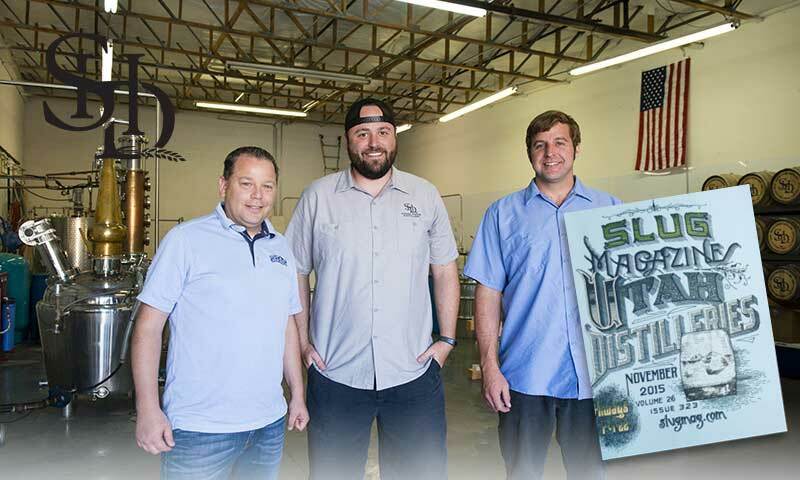 I then worked my way up to Senior Distiller.” He came on board at Sugar House in 2014, and with the addition of Jake Wood, former brewer and sales manager at Shades of Pale Brewing, the team was complete. Wood had been trying to get into the industry for as long as he could remember, and the progression from Shades of Pale to Sugar House was natural to him. “I moved from Park City down to Salt Lake and met James, and we hit it off,” he says. One of the unique things happening at Sugar House is that every one of their spirits starts with a fermentation. This is where house-cultured yeast converts the raw ingredients into ethanol, which is then purified and concentrated during the distillation process. Their vodka starts out as a mash of 100-percent Delta, Utah–grown wheat, and the difference becomes evident in the flavor—slightly sweet with a hint of grain and quite clean. “It’s a lot of work to get the vodka where it is,” says Fowler, but he could just as easily be speaking about any of the spirits. Their use of 100-percent molasses for their rums results in an extremely complex flavor in the Silver: Brown sugar and hints of vanilla combine with dark fruit, like fig and prune, which then become compounded by the aging period in barrels to produce the Gold. The Malt Whisky itself is another testament to the singular drive for quality that the Sugar House team nurtures. Many customers aren’t quite sure what they’re getting when they first buy the Malt Whisky because it doesn’t readily fit into any of the classic whiskey categories. “When we did the first release, we sold 700 bottles, and 700 people came in thinking they were buying bourbon,” says Fowler. Bourbon is the most common American whiskey, and while Sugar House does have one aging, their current whisky is wholly different. Rich and malty with a hint of sweetness and a fresh oak tang, they call it an American Malt Whisky, a style they hope becomes its own category in time. “It’ll get recognized,” says Robertson. Another group of people had only seen “malt” listed on Scotch whisky labels and were surprised when the product wasn’t peaty. “That’s what’s nice about being able to show people around here,” says Fowler, referencing the regular tours of the facility that Sugar House offers, which give them a chance to explain their products and process to customers. There’s four products to show off right now—the Vodka, Malt Whisky, Silver Rum and the barrel-aged Gold Rum—and more are on the way. A fully fermented and distilled in-house bourbon is aging in barrels right now, and at the time of writing, 100-percent rye mash was fermenting away in preparation for distillation into whiskey. There are few limits on what these three men can accomplish. “We want to stick to traditional methods,” says Robertson, “but not be bound by them—to put our own twist on them, that’s exciting.” Controlling everything they do from grain or cane to glass definitely leaves its mark on the product. They ferment the mashes, propagate yeast and are always tweaking the still, always looking to improve. “We want to set the tone for distillers in the region,” says Wood. “We want to see people just as dedicated to the craft, keeping the bar just as high.” Even though it isn’t the quickest or easiest way, you can taste the value of their hard work in the spirits.